Palm Beach Guesthouse is superbly located just metres from the beach and is conveniently situated in Summerstrand, close to shopping centres, The Boardwalk Casino and the Humewood Golf Course. The guest house offers a sea facing communal lounge, bar and dining area that opens up onto a thatched braai entertainment area with a separate private swimming pool. Six spacious free-standing suites are tastefully decorated and have secure off-street parking and private access. Optional breakfasts can be enjoyed whilst admiring the view. 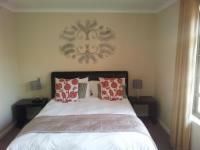 The guest house caters for the requirements of a holidaymaker, businessman or tourist. Poor wifi access in rooms. No hot water. Cold water gets restricted now and then whilst tap is open. Kitchenette not cleaned adequately. Lovely guesthouse with exceptional facilities. The host was fantastic - very accommodating, helpful and engaging. We have a 20 month old who was accommodated very well - would definitely recommend the establishment.Lovely little touches like chocolates on the pillow and the special lotions, soaps, etc. .......made us feel special. Breakfast facilities and service was lovely. We had a lovely stay at Palm Beach Guest House. The rooms had all you would need, and were cleaned daily. We stayed with our 10-month-old baby, and they had a cot available for her to use. It is very close to the beach and shops and the breakfasts were scrumptious. We will definitely stay there again. The staff were very friendly and helpful. Excellent breakfasts too! Palm Beach Guesthouse is 14.8km from the centre of Port Elizabeth , the nearest airport 7km (Port Elizabeth Airport).